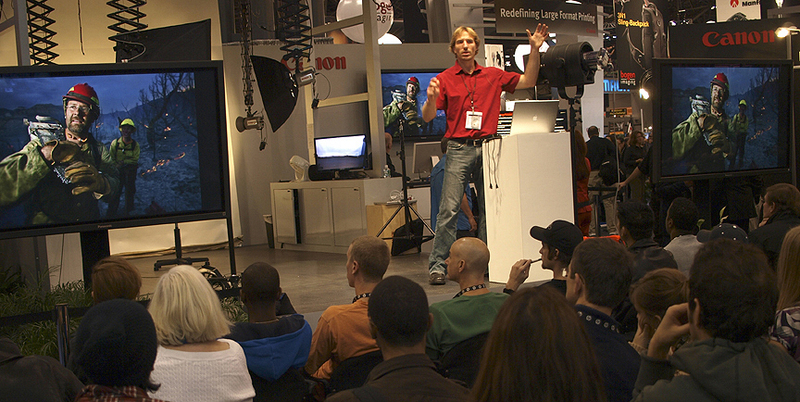 As one of Canon’s Explorers of Light, I was asked to share my photography adventures with audiences at the October 2008 PDN PhotoPlus Expo in NYC. My six lectures included tips on creating high-selling stock imagery, shooting challenging assignments with minimal equipment, and using Canon’s speedlights to their maximum potential. Thank you to Klaus Kocher for sharing this image! Take a look at my other workshops as well. As a Canon Explorer of Light, I teach multiple classes each year. The instruction in these ranges from advertising to landscape to lifestyle photography, and I hope to cater to those of all experience levels! Many workshops take place in Colorado or Utah, the most popular occurring in Aspen and Moab. Be sure to check them out! The PDN PhotoPlus Expo is great for those looking for new technology in the photo field and an education on just about every area of photography expertise there is. I look forward to presenting among other professionals and an audience of photographers of all ages and experience levels. It is well worth it to attend this event, both for education and for the newest deals on Canon’s best gear. It should be fun for everyone, and this photo lecture set is a great opportunity to get out and work with new techniques and knowledge. I hope you will be there!